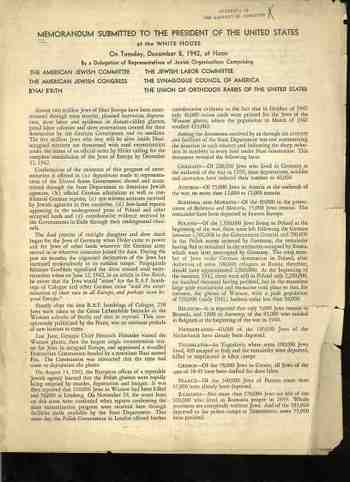 I’ve reprinted this short, four-page pamphlet on the results of a meeting between President Franklin Roosevelt and a number of eminent leaders of American Jewish organizations that took place at the White House on 8 December 1942. (See the CONTINUED READING section below for the full document.) (These groups included American Jewish Committee, the American Jewish Congress, B’Nai B’Rith, the Jewish Labor Committee, the Synagogue Council of America, and the Union of Orthodox Rabbis of the United States.) The pamphlet itself came to me in a very large acquisition I made from the Library of Congress, and it had come to the Library from the Yiddish Scientific Institute (NYC) in May 1943. There are no indications of who printed the document. Communication with the still-extant Yiddish Scientific Institute has revealed that there are unpublished files concerning this meeting but that there are no published documents regarding it. The document discusses slave labor and—in quite some detail—“Hitler’s extermination camps”, “caravans of death”, “extermination centres”, massacres”, “slow death”, and “religious persecution”. 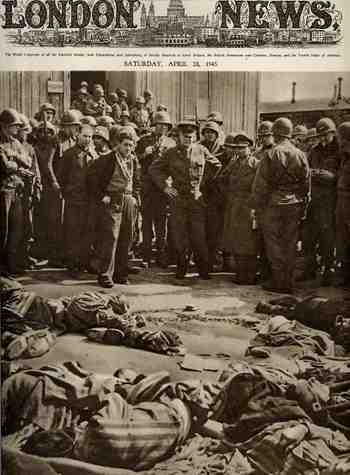 This all reminds us of the pretty deep understanding of what was going on with the Jewish people, even in 1942. “….Germany will go down in utter defeat. But the Jews of Europe, whom Hitler has marked out as the first to suffer utter extinction, have no assurance at present that a United Nations victory will come in time to save them from complete annihilation”. I cannot find the entire text of this document online. I’ve reprint it below in the CONTINUED READING section. 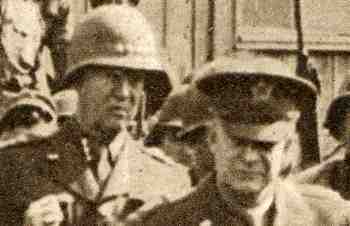 After the State Department confirmed reports that Hitler was planning to murder all the Jews in territories under German control, several American Jewish leaders including Rabbi Stephen Wise managed to arrange an audience with President Roosevelt. At this 29-minute meeting, the only one FDR had with Jewish leaders about the Holocaust, the President was presented with a document outlining the Nazi plan to annihilate European Jews. Adolph Held, the president of the American Jewish Labor Committee, wrote this report of the meeting, which indicates the president was acquainted with details of the atrocities being committed by the Nazis. The committee consisted of Rabbi Stephen S. Wise, of the Jewish Congress; Mr. Monsky, of Bnai Brith; Rabbi Rosenberg, of the Agudath, and Adolph Held, of the Jewish Labor Committee. The meeting with the President was arranged for Tuesday, December 8, 1942, at 12 o'clock. We were originally notified that the President would give us 15 minutes, but the conference lasted 29 minutes. The purpose of the conference was to present a prepared memorandum on the German atrocities in Poland consisting of an appeal to the President for immediate action against the German extermination of Jews, and also a 12 page memorandum citing the facts that have been gathered on this subject. We were taken into the President's office in the White House by General Watson, the President's personal military aide, exactly at 12 o'clock. The President was seated at his desk; in front of the desk were lined up five chairs for the delegation. The President sat behind the desk smoking a cigarette in a long cigarette-holder. The desk was full of all sorts of trinkets--ash trays, brass and porcelain figures, etc. There was not an empty spot on his desk. The figures were of all shapes and sizes. As we filed in, the President greeted Rabbi Wise: "How have you been, Stephen? You are looking well. Glad to see you looking well." Rabbi Wise then introduced each of us separately. The President shook hands with each of us, repeated the name, and then asked: "How do you do, Mr. Monsky?," etc., following which he asked us to sit down. When we were seated, the President opened the conversation by saying: "I am a sadist, a man of extreme sadistic tendencies. When I appointed Governor Lehman as head of the new Office of Relief and Rehabilitation, I had some very sadistic thoughts in my head. I know that Governor Lehman is a great administrator, and I wanted a great administrator for this post. I had another thought in my mind, however. I had hopes that, when God spares my life and the war is over, to be able to go to Germany, stand behind a curtain and have the sadistic satisfaction of seeing some "Junkers" on their knees, asking Lehman for bread. And, by God, I'll urge him to give it to them." Rabbi Wise then said: "Mr. President, we have an orthodox Rabbi in our midst. It is customary for an orthodox rabbi to deliver a benediction upon the head of his country, when he comes in his presence. Will you, therefore, permit rabbi Rosenberg to say the prayer of benediction?" Rabbi Rosenberg rose and put on his scull-cap. We all rose. The President remained seated, and, as Rabbi Rosenberg commenced to recite the prayer in Hebrew, the President bowed his head. "O, God Lord of Kings, blessed be Thy name that Thou bestowest a share of Thy glory upon the son of men." "Thank you very much"-- the President said. The President seemed to be moved, and so were we all. Rabbi Wise then read the declaration by the committee. Rabbi Wise did not read the details but simply said: "Mr. President, we also beg to submit details and proofs of the horrible facts. We appeal to you, as head of our government, to do all in your power to bring this to the attention of the world and to do all in your power to make an effort to stop it." The President replied: "The government of the United States is very well acquainted with most of the facts you are now bringing to our attention. Unfortunately we have received confirmation from many sources. Representatives of the United States government in Switzerland and other neutral countries have given up proof that confirm the horrors discussed by you. We cannot treat these matters in normal ways. We are dealing with an insane man-- Hitler, and the group that surrounds him represent an example of a national psychopathic case. We cannot act toward them by normal means. That is why the problem is very difficult. At the same time it is not in the best interest of the Allied cause to make it appear that the entire German people are murderers or are in agreement with what Hitler is doing. There must be in Germany elements, now thoroughly subdued, but who at the proper time will, I am sure, rise, and protest against the atrocities, against the whole Hitler system. It is too early to make pronouncements such as President Wilson made, may they even be very useful. As to your proposal, I shall certainly be glad to issue another statement, such as you request." The President turned toward the delegation for suggestions. All, except Rabbi Rosenberg, put in suggestions. Mine was about the possibility of getting some of the neutral representatives in Germany to intercede in behalf of the Jews. The President took notice of that but made no direct replies to the suggestions. The entire conversation on the part of the delegation lasted only a minute or two. As a matter of fact, of the 29 minutes spent with the President, he addressed the delegation for 23 minutes. The President then plunged into a discussion of other matters. "We had a Jewish problem in North Africa" -- he said. "As you know, we issued orders to free all the Jews from concentration camps, and we have also advised our representatives in North Africa to abolish all the special laws against the Jews and to restore the Jews to their rights. On this occasion I would like to mention that it has been called to our attention that prior to the war, Jews and Frenchmen enjoyed greater rights than Moslems in some of the North African states. There are 17 million Moslems in North Africa, and there is no reason why anyone should enjoy greater rights than they. It is not our purpose to fight for greater rights for anyone at the expense of another group. We are for the freedom for all and equal rights for all. We consider the attack on the Jews in Germany, in Poland, as an attack upon our ideas of freedom and justice, and that is why we oppose it so vehemently." "Now you are interested in the Darlan matter. I can only illustrate this by a proverb, I recently heard from a Yugoslav priest--"When a river you reach and the devil you meet, with the devil do not quarrel until the bridge you cross." Apparently, at the end of this quotation the President must have pushed some secret button, and his adjutant appeared in the room. His eyes and broad shoulders showed determination. We rose from our seats, and, as we stood up, the President said: "Gentlemen, you can prepare the statement. I am sure that you will put the words into it that express my thoughts. I leave it entirely to you. You may quote from my statement to the Mass -Meeting in Madison Square Garden some months ago, but please quote it exactly. We shall do all in our power to be of service to your people in this tragic moment." The President then shook hands with each of us, and we filed out of the room.